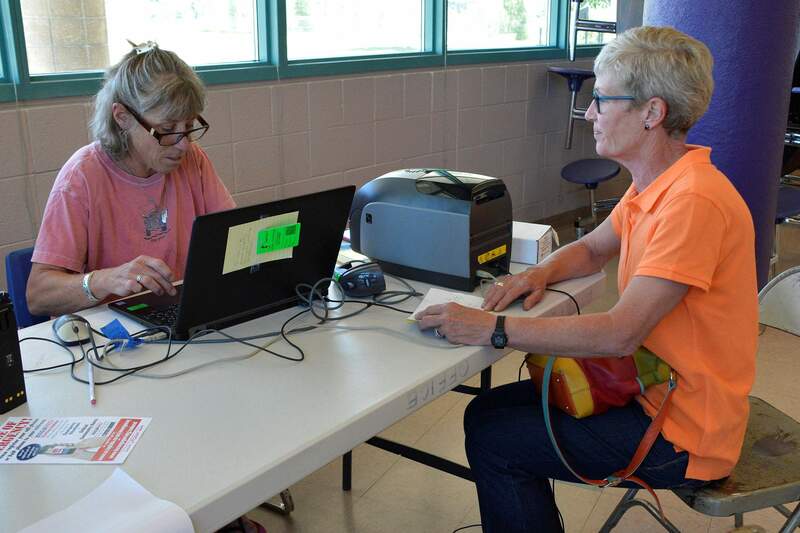 Kristi Householder, right, registers for credentials from Amy Knight, a La Plata County Search and Rescue volunteer, at Escalante Middle School. Salvation Army Emergency Services plans to serve meals to first responders and evacuees Thursday through Sunday. The Salvation Army Emergency Services, at the request of the Office of Emergency Management, announced Wednesday it will deploy a mobile feeding unit in Durango to provide food and water to 416 Fire first responders and evacuees in La Plata County. The first feeding was offered at 6 p.m. Wednesday at Escalante Middle School, 141 Baker Lane. The team of volunteers and staff is expected to be in Durango through Sunday to provide meals, snacks, water and cleanup kits to firefighters and the evacuees displaced by the fire. In an emergency, the first goal of the Salvation Army is to meet basic needs of responders and people affected by the emergency. The second goal is to assist with recovery, which can last for years. The Salvation Army will be on standby after Sunday and will continue to provide services if firefighting efforts last longer than expected. The 416 Fire has burned 29,147 acres, with more than 1,000 firefighters working to contain the blaze. To contribute to the fire relief, visit give-im.salvationarmy.org/cofires. For more information about Salvation Army emergency services, visit www.imsalvationarmy.org.